This will definitely be the month of sheathing. 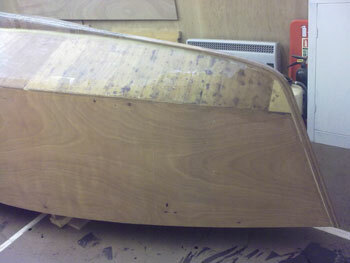 Last month, before cutting the glass cloth to size for the hull sides I had cut 4 pieces of peel ply. A somewhat ambitious approach as it proved out, but more of that later. 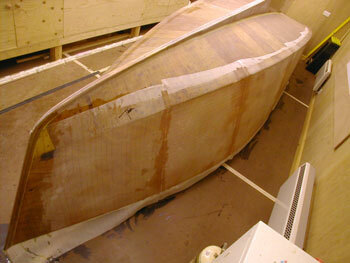 First the port side layer of glass is laid onto the hull. This fabric is so fine is easily pulls out of shape, great for complex shapes but problematic on simple ones. Finally I get it smoothed out. It's not easy pouring epoxy onto a near vertical surface. the easiest solution I found was to spoon it on using the squeegee and work fast. Finally I get the peel ply on and walk away while it hardens. 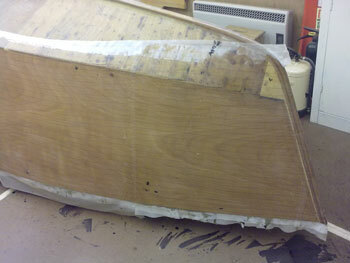 After a couple of days I trimmed the surplus fabric off and removed the peel ply. I was disappointed to see that in some areas the epoxy had slumped, not the glass just the epoxy, as I could scrape it off without exposing the fabric. After a further week of hardening I sanded the area with wetn'dry. Great for keeping the dust under control. 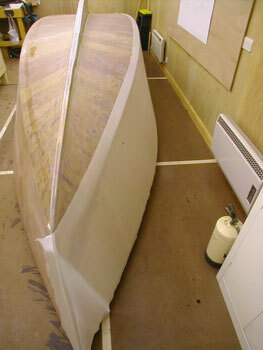 Next it was time to cut and place the starboard side fabric. It's held in place with drawing pins in case it tries to slip. I pull them out as I proceed along with the epoxy. Other than the stern the whole hull is sheathed. I wish I could stop there, but there are two more side pieces to go on.